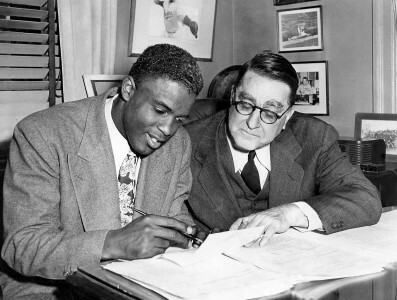 Branch Rickey, a 1904 graduate, was named the most influential figure of the 20th century in sports by ESPN. A leader in the Civil Rights Movement, he spearheaded the integration of major league baseball in the 1940s, when he signed Jackie Robinson to play for the Brooklyn Dodgers. Ohio Wesleyan produced this video honoring Branch Rickey in 2011. Then president and general manager of the Brooklyn Dodgers, Rickey knew that in order for baseball to be truly “the national pastime,” a long tradition of whites-only would have to be broken. With some help and co­operation from baseball commissioner A.B. “Happy” Chandler and, eventually, the other Brooklyn players, Rickey and Jackie Robinson made history by inte­grating the long-segregated game. The roots of Rickey's convictions about justice and equality reach back to his days as an Ohio Wesleyan student, and his OWU experiences foreshadowed his promotion of Robinson. Branch Rickey was such a talented catcher on the OWU baseball team in 1901-02 that he was offered a professional baseball contract while still at OWU. Upon signing, he became ineligible to continue playing at OWU, so he became the team's coach during his junior and senior seasons. His great success continued as the OWU coach. 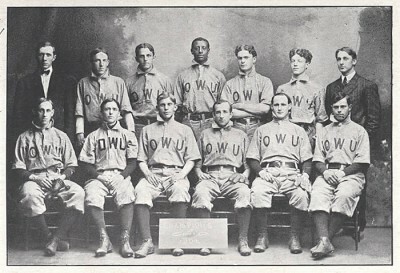 In fact, his 1904 championship team won 14 games, a school record that would stand for 81 years. During that season, Thomas was denied lodging at a hotel in South Bend, Indiana. Rickey refused to take that answer and was able to convince the hotel manager to allow Thomas to stay in his room as an unregistered guest, but the event — and the sight of Thomas sitting on the bed weeping — were burned into his memory and proved to be his inspiration in Brooklyn. Years later, actor Harrison Ford told this story in the movie 42. Born in a farming community in southern Ohio, Rickey had a strong interest in sports, academics, and business — but his moral and religious beliefs always came first. He put his baseball career in jeopardy by refusing to play for the Cincinnati Reds on Sundays. In later years, he stipulated in his contracts as a manager, general manager, and president that he would not manage or even be in the ballpark on Sundays — all to honor a promise he made his mother before signing his first professional playing contract years earlier. While still playing professional baseball in the summers, he returned to Ohio Wesleyan to coach and teach for several years before returning full-time to major league front offices. Rickey also was credited with developing the farm system of minor league teams while with the St. Louis Cardinals in the 1920s and 1930s and pioneering the use of batting helmets while with the Pittsburgh Pirates in the 1950s. After his stint with the Pirates, his plans to begin a third major league helped prompt the first expansion of Major League Baseball. Rickey’s dedication to Ohio Wesleyan was a lifetime commitment. He frequently returned to Delaware and served as a lifetime trustee. At the time of his death in 1965, he was national chairman of the University’s capital campaign. As one measure of its gratitude, Ohio Wesleyan named its new sports facility the Branch Rickey Physical Education Center, dedicated to his memory in 1976. In 2017, Ohio Wesleyan redesigned the OWU Branch Rickey Scholarship, aligning the purpose of the scholarship with the spirit of the man. As college costs have soared at many schools, we are establishing the Branch Rickey Scholarship as our commitment to make a great OWU education affordable for students who have worked hard in high school and have shown they have the ability to succeed in college. Branch Rickey believed if you have the skills, you should have the opportunity. We do, too. Learn more about the Branch Rickey Scholarship and other financial aid.